If symmetry is to have ever existed, and, you return to the original state, problems enter the picture because you are introducing "some thing" to the system? For example, you can only back up so far. The question is what does this fifth dimensional perspective allow you? You know Gravity and light have been joined? Yes, when you change visual perspective, what does a line look like, as in viewing a cylindrical system, with such a viscosity? You cannot show where droplets were injected, and to go beyond that point of submersion, an example of what begin in rotation would on reversibility, happen same. So, something is missing? My question is: could you ever learn the answer to an otherwise-intractable computational problem by jumping into a black hole? Entanglement, is not an option in such a system ? As is FTL, medium dependent? Changing viscosity rates show speed of light variance? Visualization above, has specific destination in relation to specificity of drop, as to show distance from center? Kaluza-Klein theory is a model which unifies classical gravity and electromagnetism. It was discovered by the mathematician Theodor Kaluza that if general relativity is extended to a five-dimensional spacetime, the equations can be separated out into ordinary four-dimensional gravitation plus an extra set, which is equivalent to Maxwell's equations for the electromagnetic field, plus an extra scalar field known as the "dilaton". Oskar Klein proposed that the fourth spatial dimension is curled up with a very small radius, i.e. that a particle moving a short distance along that axis would return to where it began. The distance a particle can travel before reaching its initial position is said to be the size of the dimension. This, in fact, also gives rise to quantization of charge, as waves directed along a finite axis can only occupy discrete frequencies. Kaluza-Klein theory can be extended to cover the other fundamental forces - namely, the weak and strong nuclear forces - but a straightforward approach, if done using an odd dimensional manifold runs into difficulties involving chirality. The problem is that all neutrinos appear to be left-handed, meaning that they are spinning in the direction of the fingers of the left hand when they are moving in the direction of the thumb. All anti-neutrinos appear to be right-handed. Somehow particle reactions are asymmetric when it comes to spin and it is not straightforward to build this into a Kaluza-Klein theory since the extra dimensions of physical space are symmetric with respect to left-hand spinning and r-hand spinning particles. Placing comment here until approved or not approved. Instituting a experimental argument is necessary, when t comes to symmetry in the realtor of viscosity and entanglement? Light in Ftl is medium dependent? This sets up analogue example of the question of firewalls as to imply Black holes and information? Perspective has been push back in a reductionistic sense and understanding in a cosmological sense. The limit to which this process could incorporate a relativistic explanation would have been a glorious one indeed? The Navier-Stokes equations, named after Claude-Louis Navier and George Gabriel Stokes, describe the motion of fluid substances such as liquids and gases. These equations establish that changes in momentum in infinitesimal volumes of fluid are simply the sum of dissipative viscous forces (similar to friction), changes in pressure, gravity, and other forces acting inside the fluid: an application of Newton's second law to fluid. They are one of the most useful sets of equations because they describe the physics of a large number of phenomena of academic and economic interest. They may be used to model weather, ocean currents, water flow in a pipe, flow around an airfoil (wing), and motion of stars inside a galaxy. As such, these equations in both full and simplified forms, are used in the design of aircraft and cars, the study of blood flow, the design of power stations, the analysis of the effects of pollution, etc. Coupled with Maxwell's equations they can be used to model and study magnetohydrodynamics. 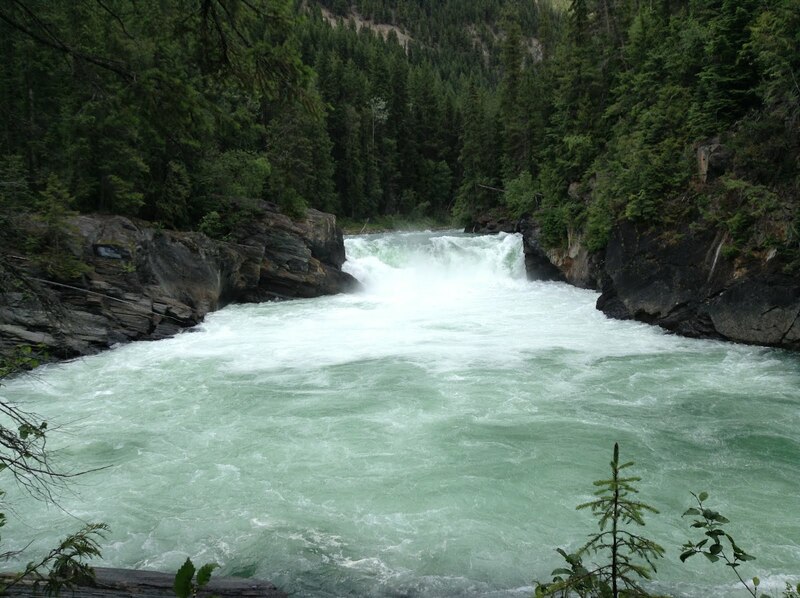 The Navier-Stokes equations are also of great interest in a purely mathematical sense. Somewhat surprisingly, given their wide range of practical uses, mathematicians have yet to prove that in three dimensions solutions always exist (existence), or that if they do exist they do not contain any infinities, singularities or discontinuities (smoothness). These are called the Navier-Stokes existence and smoothness problems. The Clay Mathematics Institute has called this one of the seven most important open problems in mathematics, and offered a $1,000,000 prize for a solution or a counter-example. So where is that? Where is the "perfect fluid" and what has this to do with the current state of the universe? 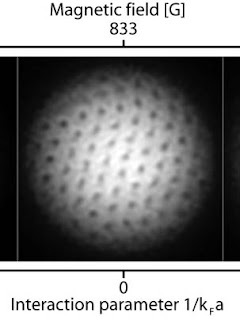 The "effect of collisions" which produce a Cerenkov effect. Is this a "faster then the speed of light" from such a process being encapsulating in that early universe condition? As perplexing as this sounds, it sets up the understanding that Super Cosmologists have to think outside the box. If no information is lost, then where did the information come from? There is a topological unfolding here that speak to mathematical designs all the while it integrates the Navier-Stokes equations in terms of it's relativistic explanation, derived from the very moments of that creation? "Helium-3 experiment replicates colliding-brane theory of cosmology." So as silly as some would have you believe that new models do not have any chance from a mathematical perspective of having lost touch with reality, is the need to explain the process in terms of natural occurrences that are going on around us, which we were not previously aware of. My area of research is superstring theory, a theory that purports to give us a quantum theory of gravity as well as a unified theory of all forces and all matter. As such, superstring theory has the potential to realize Einstein's long sought dream of a single, all encompassing, theory of the universe. One of the strangest features of superstring theory is that it requires the universe to have more than three spatial dimensions. Much of my research has focused on the physical implications and mathematical properties of these extra dimensions --- studies that collectively go under the heading "quantum geometry". 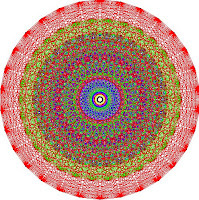 Quantum geometry differs in substantial ways from the classical geometry underlying general relativity. For instance, topology change (the "tearing" of space) is a sensible feature of quantum geometry even though, from a classical perspective, it involves singularities. As another example, two different classical spacetime geometries can give rise to identical physical implications, again at odds with conclusions based on classical general relativity. Superstring theory is most relevant under extreme physical conditions such as those that existed at the time of the big bang. Recently, we have formed a new institute at Columbia called ISCAP (Institute for Strings, Cosmology, and Astroparticle Physics) dedicated to understanding the interface of superstring theory and cosmology. One primary focus of ISCAP is the search for subtle signatures of string theory that may be imprinted in the precision cosmological data that will be collected through a variety of experiments over the next decade. In levitation post I try to explain how using Susskind's thought experiment we may derive information about the geometrical conditions being developed from "Bob" entering the blackhole on the back of a elephant. First let me remind you of where you had been taken in terms of your view of the universe. Had you realized that you are now given a micro perspective on the very nature of this universe? That given the circumstance, the elephant takes on a whole new meaning in terms of searching to understand quantum gravity at a level not considered before. So what does Susskind do? You see the very question about interpreting events in this way, ask that we push our perceptive toward topological inferences of continuity? There are no current geometrics that can be explained from inside the blackhole. Pushing perspective needed a method to help us orientate what is happening at that geometrical level. Unfortunately I lost the link to a introduction of a book below yet showed this, to help one define the context of the work that has to be done. Quantum gravity is perhaps the most important open problem in fundamental physics. It is the problem of merging quantum mechanics and general relativity, the two great conceptual revolutions in the physics of the twentieth century. The loop and spinfoam approach, presented in this book, is one of the leading research programs in the field. The first part of the book discusses the reformulation of the basis of classical and quantum Hamiltonian physics required by general relativity. The second part covers the basic technical research directions. Appendices include a detailed history of the subject of quantum gravity, hard-to-find mathematical material, and a discussion of some philosophical issues raised by the subject. This fascinating text is ideal for graduate students entering the field, as well as researchers already working in quantum gravity. It will also appeal to philosophers and other scholars interested in the nature of space and time. ......A Condensative Result exists. Where "energy concentrates" and expresses outward. I mean if I were to put on my eyeglasses, and these glasses were given to a way of seeing this universe, why not look at the whole universe bathed in such spacetime fabric? This a opportunity to get "two birds" with one stone? I was thinking of Garrett's E8 Theory article and Stefan's here. On March 31, 2006 the high-resolution gravity field model EIGEN-GL04C has been released. This model is a combination of GRACE and LAGEOS mission plus 0.5 x 0.5 degrees gravimetry and altimetry surface data and is complete to degree and order 360 in terms of spherical harmonic coefficients. High-resolution combination gravity models are essential for all applications where a precise knowledge of the static gravity potential and its gradients is needed in the medium and short wavelength spectrum. Typical examples are precise orbit determination of geodetic and altimeter satellites or the study of the Earth's crust and mantle mass distribution. But, various geodetic and altimeter applications request also a pure satellite-only gravity model. As an example, the ocean dynamic topography and the derived geostrophic surface currents, both derived from altimeter measurements and an oceanic geoid, would be strongly correlated with the mean sea surface height model used to derive terrestrial gravity data for the combination model. Therefore, the satellite-only part of EIGEN-GL04C is provided here as EIGEN-GL04S1. The contributing GRACE and Lageos data are already described in the EIGEN-GL04C description. The satellite-only model has been derived from EIGEN-GL04C by reduction of the terrestrial normal equation system and is complete up to degree and order 150. How many really understand/see the production of gravitational waves in regards to Taylor and Hulse? To see Stefan's correlation in terms of "wave production" is a dynamical quality to what is still be experimentally looked for by LIGO? As scientists, do you know this? Thus the binary pulsar PSR1913+16 provides a powerful test of the predictions of the behavior of time perceived by a distant observer according to Einstein's Theory of Relativity. Since we know the theory of Relativity is about Gravity, then how is it the applications can be extended to the way we see "anew" in our world? A sphere, our earth, not so round anymore. Uncle has tried to correct me on "isostatic adjustment." Do not have time to follow up at this moment. In context of the post and differences, I may not have pointed to the substance of the post, yet I would have dealt with my problem in seeing. In general terms, gravitational waves are radiated by objects whose motion involves acceleration, provided that the motion is not perfectly spherically symmetric (like a spinning, expanding or contracting sphere) or cylindrically symmetric (like a spinning disk). A simple example is the spinning dumbbell. Set upon one end, so that one side of the dumbell is on the ground and the other end is pointing up, the dumbbell will not radiate when it spins around its vertical axis but will radiate if it tumbles end-over-end. The heavier the dumbbell, and the faster it tumbles, the greater is the gravitational radiation it will give off. If we imagine an extreme case in which the two weights of the dumbbell are massive stars like neutron stars or black holes, orbiting each other quickly, then significant amounts of gravitational radiation would be given off. Given the context of the "whole universe" what is actually pervading, if one did not include gravity? 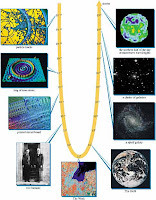 So singularities are pointing to the beginning(i), yet, we do not know if we should just say, the Big Bang, because, one would had to have calculated the energy used and where did it come from "previous" to manifest? So some will have this philosophical position about "nothing(? )," and "everything as already existing." Wherever there are no gravitational waves the space time is flat. One would have to define these two variances. One from understanding the relation to "radiation" and the other "perfectly spherically symmetric." I had been following this research because of what I had been trying to understand when we take our understanding down to a certain level. That level is within the context of us probing the collision process for evidence of "some new physics" that we had not seen before. One of the only ways to probe small neutrino masses is to search for neutrino oscillations, where a neutrino of one type (e.g. numubar ) spontaneously transforms into a neutrino of another type (e.g. nuebar ) For this phenomenon to occur, neutrinos must be massive and the apparent conservation law of lepton families must be violated. The probability for 2-flavor neutrino oscillations can then be expressed as P=sin2(2theta) sin2(1.27 m2L/E) , where theta is the mixing angle, m2 is the difference in neutrino masses squared in eV2, L is the neutrino distance in meters, and E is the neutrino energy in MeV. In 1995 the LSND experiment  published data showing candidate events that are consistent with numubar->nuebar oscillations. Additional data are reported here that provide stronger evidence for numubar->nuebar oscillations  as well as evidence for numu->nue oscillations. The two oscillation searches have completely different backgrounds and systematics from each other. What valuation of this process allows us to think that while speaking to "probing this perfect fluid" that we had not discovered some mechanism within it, that allows us to see Coleman Mandula effects being behind, as a geometrical unfoldment from one state into another? If we had looked at the Genus 1 figure then what avenue would help us discern what could come from the string theory landscape and the "potential hill" discerned from the blackhole horizon? What tunnelling effect could go past the hill climbers and valley crossers to know that you could cut "right through the hill?" 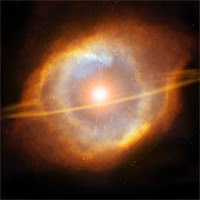 BATAVIA, Illinois—Scientists of the MiniBooNE1 experiment at the Department of Energy's Fermilab2 today (April 11) announced their first findings. The MiniBooNE results resolve questions raised by observations of the LSND3 experiment in the 1990s that appeared to contradict findings of other neutrino experiments worldwide. MiniBooNE researchers showed conclusively that the LSND results could not be due to simple neutrino oscillation, a phenomenon in which one type of neutrino transforms into another type and back again. 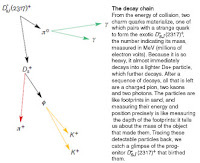 So while I am looking for some indications as I did in the strangelet case, as, evidence of this crossover, this had to have some relation to how we seen the neutrinos in development. This was part of the development as we learnt of the history of John Bahcall. John Bahcall 1934 to 2005 See also "John Bahcall and the Neutrinos"
No cross over point? What role would Navier Stokes play in this? This does not minimize the work we see of Gran Sasso in relation to the LHC project. Honestly, I do not know how someone who could work on the project, could not know what they were working on? It as if the "little parts" of the LHC project only cater to the worker Bees working just aspects of the project and their specializations. Whilst now, you go way up and overlook this project. To see the whole context measured within that "one tiny big bang moment." Trust me when I say, we shall not minimize the effect of calling the collision process as "one tiny moment," for you may never see the whole context of this project being developed for this "one thing." I did not realize the shortcomings that scientists place on themselves when they do specialize. I just assumed they would know as much as I did and see the whole project? I do not say this unkindly, just that it is a shock to me that one could work the string theory models and not realize what they are working on. I have heard even Jacques say there is no connection and listening to Peter Woit, I was equally dismayed that he did not realize what the string theory model was actually doing as it found it's correlation in the developing views of how we look at the moments of creation. The next step will again be taken in Japan, with the new J-PARC accelerator starting in 2009 to send neutrinos almost 300 km, again to the Super-Kamiokande experiment, to probe the third neutrino mixing angle that has not yet been detected in either atmospheric or solar neutrino experiments. This may also be probed in a new experiment being proposed for the Fermilab NuMI beam. One of the ideas proposed at CERN is to probe this angle with an underwater experiment moored in the Gulf of Taranto off the coast of Italy, viewing neutrinos in a modified version of CERN's current Gran Sasso beam. 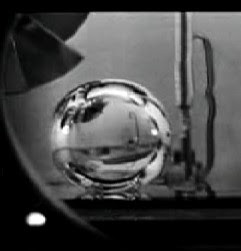 See "CERN and Future Experiments"
I think my comment on previous post of looking for the perfect fluid should have been here. Also I do not think this changes how we look at string theory as a model probing the perfect fluid, and "the understanding" of developing a mechanism for this "cross over point?" Topologically, how would this have been revealed in the string theory landscape?? See here and know that Clifford again deleted the short little post above. The point is I think for some reason once I mention string theory or evn M theory in relation to what is transpiring in the views of model development he doe not like this and would be support by Jacques as well. That would be my job to convince them and anyone else that hold their views that taking our view to the microseconds, there is a definite relation to the timeline whether you agree with this or not. By introducing "the point of the cross over" you in effect have taken the model and presented it as part of the mechanism for this universe and effectively given new meaning to the "string theory landscape." You may want it to be "background independent" like Lee wants it to be, but if you view the background as a oscillatory one, then any idea as configured to the mass of any particle, then you have define this particle as a energy relation? So Lee does not like the oscillatory universe? See "Finiteness of String Theory and Mandelstam"
It is contained "within the moment" of the creation of this universe, yet, we do not know what design this particle is to be in context of the microscopic view of geometrical topologically finishes? As the Genus 1 figure and as an expression of this universe? You had to know what was lying in those valleys, and the potentials of expression, and I relay that in the blackhole horizon as a potential hill. The time has come for some changes in this blog and I have been thinking about moving on. While a layman, I do not like to be treated like a fool. Maybe not educated fully and with some work to do, but never as a fool. Blackhole evaporation: What's New From the Subatomic-Sized Holes ? See What is Cerenkov Radiation? We are being "politically correct" (a sociological observation) when we change the wording of the "microstate blackhole production" to "Sub Atomic Sized Holes?" To maybe "inferr" the desired differences of cosmological blackholes, versus, what we see quickly evaporating in subatomic-sized to be revealed in a footprint? 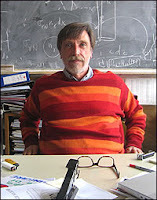 David Kestenbaum, NPR-Alvaro De Rujula is a physicist at CERN, the world's largest particle physics laboratory. Three hundred feet below his desk, workers are building a massive particle accelerator that will be capable of reproducing energies present just after the big bang. Let's pretend that the reporting was not so good back in 1999, and the information we had then was to cause some needless concerns? Good reporting already existed in term of what the Dark Matter was doing. Now it's okay if someone else saids it, and reveals all the dark matter info with Wikipedia. How nice:)Your credible? Was there any evidence to think a method was already determined "back then" and has become part of the process of discovery? At first bad reporting? Producing fear into the public mind? Alvaro was the one who put "James Blodgett of Risk assessment" at ease in regards to strangelets. Now, could strangelets have been considered a consequence of the evaporation? Does this not look similar? Usually all physicists see are the remnants of a new particle decaying into other types of particles. From that, they infer the existence of the new species and can determine some of its characteristics. Now everything is safe and cozy with these subatomic-sized holes which would simply evaporate. :) How would you know "what is new" after the subatomic holes had evaporated? Are sterile neutrinos new? While these paragraphs have been selective, they show that experimental processes are being used and detective work applied. Any add on experimental processes at Cern with regards to the LHC are reflect in this second paragraph? "We find," Chiao said, "that a barrier placed in the path of a tunneling particle does not slow it down. In fact, we detect particles on the other side of the barrier that have made the trip in less time than it would take the particle to traverse an equal distance without a barrier -- in other words, the tunnelling speed apparently greatly exceeds the speed of light. Moreover, if you increase the thickness of the barrier the tunneling speed increases, as high as you please. So while one may think I have some "new process" to make the world happy, it is nothing of the sort. It is interpreting the current theoretical models in regards to current experimental research. For some reason some scientist think that one can be devoid of this reasoning and apply it to any model/person, while the scientist/lay people already know what is required. So do you think that Clifford of Asymptotia is practising what he did not like in Peter Woit's summation of the state of affairs in string theory? That while criticizing him he was doing the same thing to others? I laughed when I came across the censoring post on Not even Wrong, and why I had to write my new article on Censoring. Don't worry Peter I certainly won't be crying on your blog. Deletion knows it boundaries in terms of censoring there too. :) But anyway, onto the important stuff. Now it may not seem so odd that I would place a string theory landscape picture up for revue, and have one think about hill climbers and valley crossers. Would it be wrong not to include the "potential hills" and the thought of the "blackhole horizon?" It was "theoretical appealing" as a thought experiment to me, to think about what could traverse those potential hills. We had to use "a mechanism" to help us understand how the cross over point was being established and "new universes" begin to unfold? New particle creation from such collision processes had to be established first. Both at Cern and with "high energy particles from space." IceCube was to be the backdrop for the footprint, and resulting Cerenkov radiation from that collision process? One needed to see such experiment as taking place currently to help us see the jest of where science is currently taking us on our journey's. So you had to be able to see this process in action back to the insecurities of our ignorance, in relation too, sub-atomic sized holes...ahem...dualites? So you had to know that the collision process would detail some "crossover point" for consideration? What this means that "after the collision process" you are given a new particle with which to work. You need to be able to capture this "new particle" and the mediums with which this is done, are the barriers that supply the back drop for foot prin,t to what can be traversed in faster then light potentials. Again Gran Sasso, and let's not forget ICECUBE. Is it not important to see the experimental process as a natural one? So here we are talking about the "before" and "after" and we had not spoken about the point of exchange here? If I were to tell you that such a reductionistic process had taken us to the limits what the heck could this mean? That we had indeed found the transference point of energy to matter, matter to energy and we say it may be the perfect fluids that supplies us this "anomalistic behaviour" with which we will introduce the GR? Talk about Navier-stokes in relation to the perfect fluid and what and how something can traverse through and come out on the other side? You should know that that the names of the Bee people have their names protected, to protect the community at large. Some larger human species, like to use the benefits of this society, without recognizing the constructive efforts that goes into this elixir Production. We know that that kind of information is encoded in the signal because people in Denmark have created a robotic honey bee that you can plop in the middle of a colony, programmed to dance in a certain way, and the hive members will actually follow the information precisely to that location. Researchers have been able to understand the information processing system to this level, and consequently, can actually transmit it through the robot to other members of the hive. Many times people have used Ant world to illustrate their ideas, but the time has come, that the relationship to perspective dynamics at that level should think about the vast literature of Bee people. The second of five Lagrangian equilbrium points, approximately 1.5 million kilometers beyond Earth, where the gravitational forces of Earth and Sun balance to keep a satellite at a nearly fixed position relative to Earth. 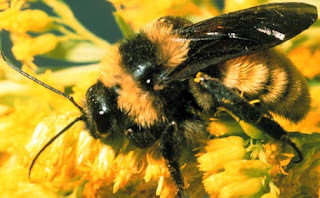 One should not think these people have been disassociated from reality, and that it has only been our ignorance of the economics and flight patterns, that we failed to see the dynamical community that bee propagation goes through, in order to continue it's rich development. The elixir production is coming out of that community. Flower pollination is a interesting thing having considered the world that the Bee people live in. After all, the dynamics and travel used, one could not help being enamoured with the naturalness with which one may try to reproduce in human mechanistic movement, that the Bee people live and breathe. Humanistic intelligences is a larger format, to what they do in that Bee community? Cell construction provides for the further propagation of the community, but no where do the Bee people give the particulates of the cell construction? Humanistic intelligences only see the community with regards to the Bee movements :)The Bee people have a greater depth to what is seen. Observing the community at large, the Bee people have much more to present then thinking just in the way they work. Who is Navier Stokes of the humanistic intelligences to think only he could reveal anomalistic perception in the nature of viscosity, not to think there is relativistic conditions that the Bee people bring to reductionism views in physics? The workers have a variety of tasks to perform – some collect nectar from flowers, others pollen, some are engaged in constructing new combs, or looking after the developing larvae, some perform the duty of cleaning the cells or feeding the larvae on special secretion that they regurgitate from their mouth parts. In these insects the exact task of any individual depends largely on its age, although there is a certain flexibility, depending on the requirements of the hive. So I've taken a different tack here. If it is so hard for the community at large to comprehend that extra dimensional thinking then there has to be some way in which we as lay people can envision the acrobatics of a busy bee and their flight plans? What the community is all about. Who is doing what? Consider ants crawling on a tabletop. In their daily experience, they can explore only 2 dimensions, those of the table surface. They may see a bee up flying, or occasionally landing on the table top, but that 3rd dimension is something they can only see or imagine, not experience. Perhaps we are in an analogous situation. Instead of a tabletop, we live in a 3-dimensional space called 3-brane (a name generalizing 2-brane, i.e., membrane). For some reason, we (i.e., atoms, molecules, photons etc.) are stuck in this 3-brane, even though there are 6 additional dimensions out there. Gravity, like the bee, can go everywhere. We call this the brane world, a rather natural phenomenon in superstring theory. At the moment, physicists are working hard to understand this scenario better and to find ways to experimentally test this idea. The Bee people had graduated from the world of the ant people, jsut by their evolutionary timeline. They were "much more visionary" then the ant people. Because they could leave their three dimensional world of the table top, and pop into ant world's frame of reference. Ant people were never the wiser. Just that, Bee people existed. Brane theory development needed a boost from the Bee people. Not only now do we understand the "dynamical thinking that goes with the Bee's flight patterns," we are now thinking, hey, "can these things apply" to the current solutions the humanistic intelligences persevere to unfold in their space travels? Not just "our waist lines" as some might think in regards to "lensing" and the circles we apply in "computerize efforts." The range of territory of the Bee's community is well considered? Sometimes it is necessary to see the deep impact a thought could have as we try to understand the implications of a "sphere dropped in a viscously liquid" that we might find another correlation in how we see the photon affected in the gravitational field. Can we grasped the feeling illicitated to say we have some what of a deep impact in remembering to think the strange world of fluids could entertain us? η is the fluid viscosity (dyne sec/cm2). I was loosing the train of thought within this post, and then the thought occurred me. Why are planets round. This is a "general question" which leads to how we see the formation of the planets? Start there. We also know what a "sphere of water" looks like in space? While the sphere was being thought of in regards to Stokes's Theorem, I was also thinking of the earth in relation to how we see gravity in regards to the earth already formed. The vicissitude, in which the earth exists within the cosmos. The moon. It is very possible that the information is inundating my thinking here yet without considering the context of the super fluid what requirements would fit the idea that earth is relevant when it comes to the molten core? Or how you see the magnetic field shifting in relation to the poles? Thus, water is "thin", having a lower viscosity, while vegetable oil is "thick" having a higher viscosity. All real fluids (except superfluids) have some resistance to shear stress, but a fluid which has no resistance to shear stress is known as an ideal fluid or inviscid fluid (Symon 1971). I am quickly posting this and will have more to add. I wanted to speak directly to the idea of the super fluid. How the "irrotational value of the perfect fluid as a whole," could have it's leakages to the surface of the earth, as small vortices created. This computer simulation shows the Earth's interior as its magnetic field reverses, perhaps because of changes in the flow of molten iron in the core. Deep inside the Earth, the magnetic field arises as the fluid core oozes with hot currents of molten iron and this mechanical energy gets converted into electromagnetism. It is known as the geodynamo. In a car's generator, the same principle turns mechanical energy into electricity. No one knows precisely why the field periodically reverses, but scientists say the responsibility probably lies with changes in the turbulent flows of molten iron, which they envision as similar to the churning gases that make up the clouds of Jupiter. In theory, a reversal could have major effects because over the ages many aspects of nature and society have come to rely on the field's steadiness. Quasar posted a comment there that immediately made me think what the topic could mean in relation to the post he was commenting on. I thought of the earth's core as the subject was related, and thought how nice it would be to have such a "cylindrical channel that goes from pole to pole?" So is it the iron in particular that gives us our strength based on it's fluid's nature? In educating myself I learnt to trust my intuition when it comes to defining the basis of "new physics" that was to emerge. As well as, the new particle manifestation that would arise from "specific points" on interaction. What was suppose to be our starting point. This is really difficult for me to put into words, yet, if you knew that there was a "change over/cross over point" and how was this defined? It seemed to me, we had to have a place that would do this. "Nothing" is difficult to talk about, and "empty space" is not really empty. So to think "nothing" is a very hard one for me to grasp. If one thinks about what "sprang into being" I of course had to find this "place of traversing" from "one state of being" to another. What things help us to define the nature of that point? 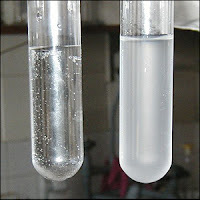 Example of the viscosity of milk and water. Liquids with higher viscosities will not make such a splash. Viscosity is a measure of the resistance of a fluid to deform under shear stress. It is commonly perceived as "thickness", or resistance to flow. Viscosity describes a fluid's internal resistance to flow and may be thought of as a measure of fluid friction. Thus, water is "thin", having a lower viscosity, while vegetable oil is "thick" having a higher viscosity. All real fluids (except superfluids) have some resistance to shear stress, but a fluid which has no resistance to shear stress is known as an ideal fluid or inviscid fluid (Symon 1971). I used the question mark not to befuddle those that read here or sanction any post to some idea about what the title following with a question mark, is worth so many points on the "flowery scale." I shall have to define "flowery scale" sometime, but I would rather not give any credit to those who hold a position in science who have categorize people according to that same point system. Oh and please, do not consider the flowers less then what I hold as of high value in these "maturations" to be thought less then either. While we had been witness to the collider experiments we were also quite aware that that such events had to be taking place with earth, from event sources released in space. Flat space time? The thought there are strong gravitational forces at work and where are these located? Can there "be" amidst this strong curvature, the idea that a super fluid born, would have a place where a state of inertia could exist? I thought quickly of what happens when the blackhole collapses and what could come of it? Of course this concept of inertia is strong in my mind but would need better clarifications as I am relaying it here in this circumstance. But looking for these locations in Lagrangian views of the Sun Earth relation, it seemed viable to me that such a state could have gone from a very strong gravitational inclination( our suns, increase temperatures of the collapsing blackhole) to one that is "very free" and "not flat" but would allow information both ways(from before to now) to be traversed, as if in a jet or cylinder. So that the space around it would be expression not only the earlier constituents of the universe before this translation but manifest into the new physics with which would motive this universe, new particle manifestation, from what did not exist before.